Attend a Training magazine Certificate Program without leaving your office! In this live, online workshop, starting on September 5, 2018, you’ll explore each phase of the Instructional Design process and work on your own eLearning project. This interactive certificate uses real-world, practical examples to explore each phase of the Instructional Design process and shows you how to apply them in your project. You’ll work on your own eLearning or instructor-led project and learn just what you need to produce a highly effective end product. You’ll examine the business and individual needs for your training program, how to accommodate adult learners, instructional strategies to meet your goals, and more. You will receive numerous job aids and examples to hit the ground running. BONUS! You’ll receive a 101-page participant guide containing job aids, examples, worksheets and key points for you to use as you design and develop your courses. You will have the opportunity to submit your project work during the certificate program for feedback by your instructor. 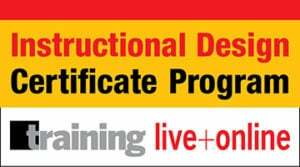 This certificate is designed for those on the front-line of designing, developing, writing, and delivering training through instructor-led, eLearning, and blended methods. Instructor: Tom Welsh, Senior Instructional Designer, Darryl L. Sink & Associates, Inc.